The Women’s Irish Cue-Sports Association was officially formed at a meeting in December 2016. This newly formed Association is a sister Association of RILSA and will be helping to promote, support and advise women and young girls who wish to take up cue sports at any level. 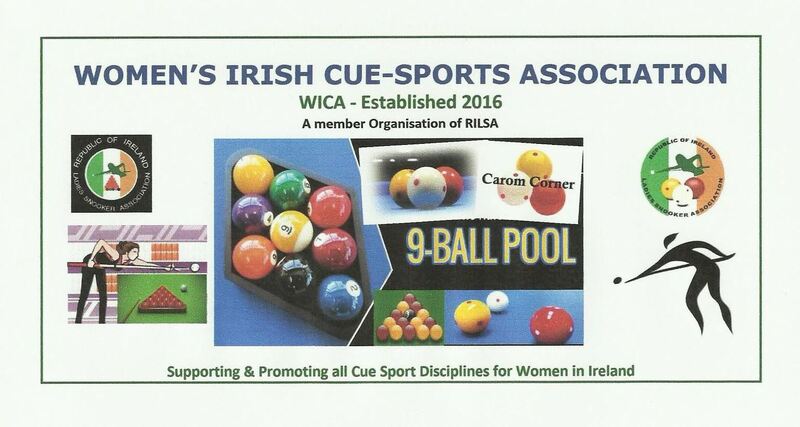 RILSA & WICA as a combined group will now further strengthen cue sports for women in Ireland. All Cue-Sport disciplines will be catered for as WICA initiates its events during 2017. With the recent merge between RILSA & SARI (sport against racism Ireland) the three combined organisations will have a much greater audience in promoting women’s cue sports in Ireland. The Board & committee members of RILSA welcome such merges and initiatives as the promotion and development of a unified groups of volunteers and like minded people come together in support of female cue sports.